An LED (light emitting diode) is a semiconductor device generating light when current flows through it, and is provided in the form of a PN junction diode fabricated from by way of example GaAs or GaN optical semiconductor which converts electric energy into light energy. Middle-power light emitting diodes are generally packaged within surface mounted device (SMD) housings. A SMD LED package is one of the LED packages, in which electrical connectors come through the underneath of the substrate. Along with the wide application of LED in the general lighting market, the higher lumen output is requiremed to meet the specifications and contend with other light sources. To increase light output, it is sometimes desirable to use multiple dies in serial or in parallel in a unit. A midrange LED is best suited for applications that demand approximately 10 to 100 lumens; owing to midrange LEDs’ increased light output, they are able to handle currents up to 100mA. Mid-power LEDs are worthy of use in a range of cost-conscious lighting applications. Typical applications include panel lights, tube lights, flood lights, emergency lighting, and taillights. 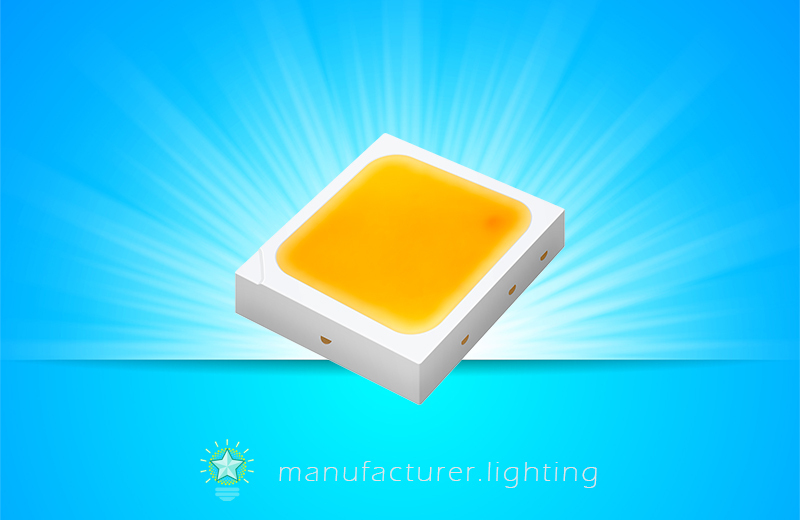 These mid-power devices provide high quality white light, impressive luminous efficacy and superb thermal performance. Along with delivering specified correlated color temperature and color rendering combinations, these emitters give you the efficacy and reliability necessary for indoor illumination markets.